Due to its unique shape with a catch it can be hung into the holds perfectly. Designing it we had a close look on handling and ergonomics. All curbs and spikes are rounded, so risk of injury is minimized. Even the tree is protected, because the catch prevents nonsensical hammering into the bark. The “HU.go” hold by Austrialpin assures best grip. The Treetool can easily be secured against unintended falls by attaching it to some cord. Hang on – you´ll love it! Climbing hold set "Rock & Ice"
Set with 10 climbing holds without screws. Useable with our newly developed "Treetool". 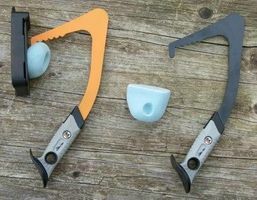 Single hold "Rock & Ice"
Climbing hold without screw. Utilizzabile con "Treetool". 20 Monkeys + accessorio. Utilizzabile con "Treetool".